Hunting the spring season on Unimak Island, Ed Joseph of Burbank, California, harvested this 10’+ bear with a 28 ½” B&C skull. 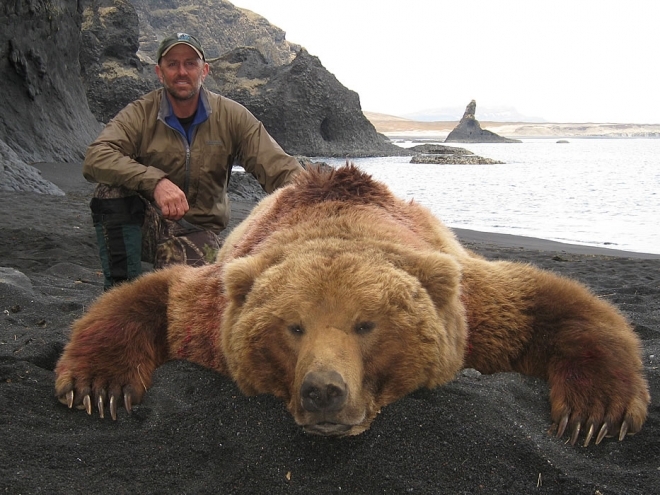 Ed spent twelve days hunting hard with us to finally get the opportunity for his great bear. There are sometimes unique scenarios that take place on Unimak. Once Ed harvested his bear it was a challenge to get access to the bear for recovery due to rock formations on the beach line and an incoming tide, but the timing was right and Ed’s determination prevailed!